Brief Synopsis – Prince Akeem of the African Nation of Zamunda travels to America to find a bride for himself instead of marrying the woman his parents chose for him in Zamunda. My Take on it – I remember really enjoying this movie when I saw it in the theater 25 years ago. Obviously, I didn’t enjoy it as much as I did back in the days, since after seeing a movie so many times, you run the risk of not enjoying it as much. Eddie Murphy and Arsenio Hall began what became a staple for them (each play a number of characters) and at least in this movie, it pans out. They are great!! Most of the characters they play are recognizable as themselves, but Murphy’s best imitation is of the old white guy in the barber shop. I didn’t know I was him the first time I saw it and was quite surprised when I found out. The story and plot lead to lots of hilarious scenarios and in addition to Hall and Murphy, great supporting performances by James Earl Jones, John Amos, Frankie Faison and a young Eriq La Salle (pre-ER). Look for a great cameo by Samuel L. Jackson and a scene feathering Don Ameche and Ralph Bellamy. 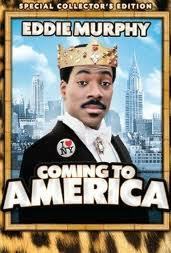 This movie was the end of Eddie Murphy’s successes after Trading Places (1983), 48 Hrs. (1982) and of course Beverly Hills Cop (1984), 90% of his future movies were awful.